SwimFin makes learning to swim easier, quicker, and more fun! 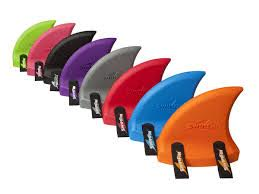 SwimFin works in harmony with the swimmer to find a natural swim position. SwimFin is the first truly new development in the teaching of swim for decades – tried and tested to assist anyone in learning to swim it is the ultimate swimming aid. SwimFin compensates for different abilities, providing as much support as the swimmer needs, yet giving confidence to even the most timid learner. SwimFin complies with international safety standards (EN71 and EN13138 – toys and swim aids), providing enough buoyancy to keep an adult afloat. And after it has done it’s job as a learning-aid, SwimFin will always find use as a fun water toy. Inspires imagination and play – for all ages, abilities and strokes (2yrs+)!